More and more consumers are starting to care about the state of the environment, and they’re willing to put their money where their mouths are. Approximately 84 percent of global consumers say that they intentionally seek out products that are more sustainably made. Additionally, as the Millennial generation makes up higher and higher percentages of the consumer market, it’s essential to make changes to keep them interested in your business. And, for Millennials, sustainability is at the top of the priority list. This may be one possible reason why so many businesses are looking into more environmentally friendly flooring solutions. So, when the time comes to find a new flooring option for your business, make a point to consider flooring options that are green and sustainable. No matter what industry your business is in, there’s a strong possibility that you have a lot of fierce competition out there. That means that every penny you spend must be spent wisely. And, while, every business would love to be able to impress their partners, clients and customers with beautiful hardwood or real stone floors, spending an arm and a leg on flooring is not always the best use of your budget. However, there are benefits to spending more upfront on your flooring, as you’ll likely get more life out of it, but many businesses are looking for a more affordable alternative. Luckily, vinyl and linoleum floors are now made with technology that makes them look just like natural wood and stone floors. Plus, these affordable alternatives are generally more durable and can better withstand foot traffic than the real thing, which makes them an even smarter investment. For companies who want to settle for nothing less than real hardwood floors, engineered wood is the perfect choice. Engineered wood is made by crossing multiple layers of fiberboard and plywood — with each grain of wood running in a different direction — which is then attached to a base made of solid wood. This makes engineered wood floors a lot more durable and stable than traditional hardwood floors, making it ideal for a whole host of spaces where traditional wood isn’t so ideal, including areas that are slightly damp or below grade. While traditional hardwood floors work for offices, engineered hardwood floors are perfect for everything from restaurants to gyms. 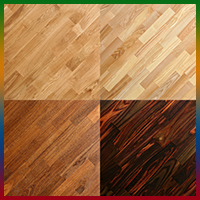 Additionally, the top layer of engineered wood floors is available in a number of wood species, finishes and colors, so you’re sure to find an option that will work for your business. 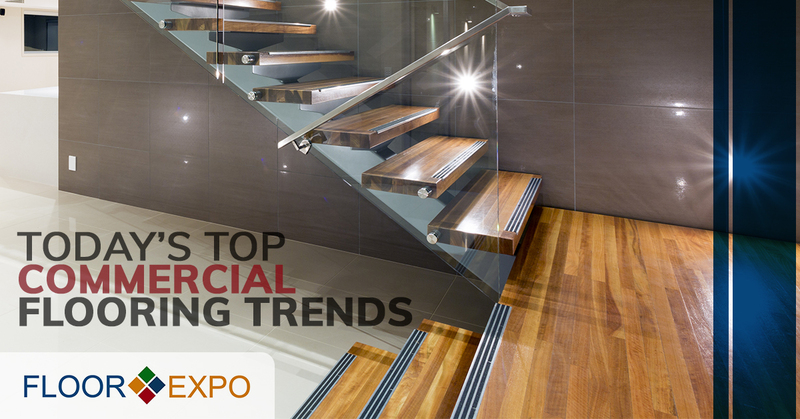 Let Floor Expo help you stay up to date with the latest commercial flooring trends. Trends come and go, but here at Floor Expo, we believe that today’s top commercial flooring trends will stand the test of time. So, whether you’re looking for engineered wood floors, you want something affordable or you want something sustainable, turn our professionals today! Feel free to stop by our huge flooring showroom in Fairfield any time to see our wide selection of flooring options up close, and don’t hesitate to contact us if you need help finding the right option for your needs. We even offer free design consultations!